"For the fella that has a young family, struggling to make it, don't put it off. Do it now. You can always go quickbuild later on if your circumstances improve. What's a 4 by 8 sheet of aluminum these days? 80 bucks or so. You can build the rudder for your airplane from that one sheet. And then you'll have a finished part ready to go!" So says Mark Townsend of Can-Zac Aviation, the Canadian distributors of Zenith Aircraft. Mark was waxing enthusiastic as he proudly described the recently released 3.5-hour DVD, which takes the novice builder by the hand and gently leads him into the construction of a complete Zenith rudder and wingribs. Townsend freely admits that production values may fall a bit short of the Hollywood blockbuster category, but this is more than made up for by the addition of a few humorous elements. "There is a sock puppet," Townsend says, "who steals lunch." Targeted at the budget minded builder who can't justify the extra expense of the quickbuild option, "Scratch Building Basics for Metal Aircraft" is a two-DVD set that sells for a modest $39. It can be ordered online at www.homebuilthelp.com. If you're considering the realities of scratch-building, or are just unsure of what's required of a builder, this series is a good place to start with minimal investment. If you have a phone or PDA with a Microsoft OS, you might well be interested in the WingX software now marketed by Jeppesen and introduced today at Sun 'n Fun. For $169 the first year, you get graphical weather, TAFs, winds aloft, a complete Airport Facilities Directory and JeppGuide with one-touch dialing for FBOs. You also get FARs with Jeppesen FAR Explained, weight and balance with nearly 500 planes already in the database (but no homebuilts, and not my Cessna 175), sunrise/sunset, and a section that keeps track of all your currencies—tailwheel, IFR, BFR and more. Blackberry will be next, and then iPhone. After the first year, renewals are $129. And if an Internet download gets interrupted, you don't have to start over from the beginning. 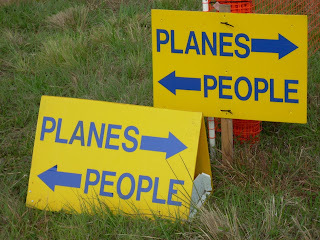 WingX is at hiltonsoftware.com, and the manual for the Jeppesen version and FAQ are at jeppesen.com/mobile. Puddles and mud from recent rains made lots of work for dedicated volunteers and confused parking for attendees at Sun 'n Fun. A pair of Sandhill Cranes ignored the people at the ticket booths, and vice versa. 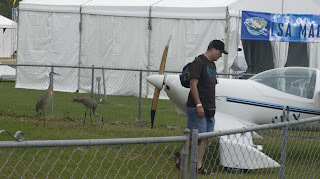 First impressions of the show are a few interesting new attractions (the Lancair Evolution turboprop and the Grand Rapids synthetic vision flight instruments), but consider that computers now have a useful life of maybe five years before the new ones are so compelling that you've got to have one. Is that the future of avionics—five or maybe 10 years and you replace them with something more capable, more fun, or just new? Several new EFIS models and upgrades have been introduced at the show today. 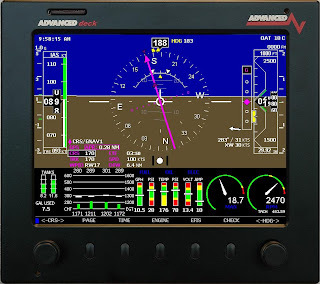 For fans of the EFIS, the talk of the show so far has been Advanced Flight’s new EFIS, called the Advanced deck. This unit is in addition to the AF-3400 and AF-3500 models already shipping. The Advanced deck features a new tray mounting system, an additional front knob/joystick, a faster processor than the 3400/3500 units, 16 times more memory capacity, and a host of new features. The 8.4-inch diagonal display is the same size as the 3500, but the bezel now includes two knobs, including one that has a four-way "joystick" control. I stopped by the Advanced Flight booth, muscled up to the front to find Rob Hickman and Relentless pilot Kevin Eldridge chatting about the new product. In a word, it looks superb. The screen is bright, and the new mapping (actually shown last year) is slick. I particularly like Rob's new tape implementations. This unit can be ordered, like the others, as an EFIS, engine monitor or combined unit. Prices start at $4465 for the engine monitor, up to $6793 for the combined EFIS/engine monitor. Other versions are available. Also garnering a lot of interest was an upgrade to Grand Rapids' new high-resolution EFIS called the HX that provides 3D terrain awareness. Using the same box and wiring connections as the HS, this new iteration has a substantially stronger processor and more internal memory. I spoke with GRT's Greg Toman, who commented on the fast movement in computer technology. "We have [system] vendors come to us all the time with better, faster processors," he said. The new HX will be a $2400 upgrade from an HS or WS Horizon EFIS, or $4000 if you're starting fresh. Grand Rapids offers an almost bewildering array of options, including an internal GPS (RAIM or no), XM WX onboard weather, plus engine monitoring in the form of the EIS module, which is fully compatible with the new HX EFIS. We don't have a photo yet, but here's a link to a PDF brochure. We hope to have a video run-through of the HX's features later in the week. Testing is taking place now; deliveries are expected this summer. Technically, this is not a new EFIS, but Dynon's new autopilot will be tied directly to its EFIS-D100 or D10A, or FlightDEK-D180. For $750 an axis, you add just the servos to the EFIS to get yourself an autopilot. Two external control boxes will be offered; the AP74 ($450) provides dedicated buttons and a value knob that will also set bugs even when the autopilot isn't engaged. A second module, the AP76 ($1400), will be offered later in the year. I spoke at length with the Dynon engineers at the show, and many of the features are still being discussed internally. So far, the autopilot is being flown in a handful of airplanes, and the company is aggressively developing new installations. In fact, I'm due to be a beta tester for the Glastar Sportsman installation. Dynon's approach is interesting. Rather than sending a big bundle of wires to the stepper-motor servos, the system uses the Dynon Smart Avionics Bus (DSAB), a two-wire networking setup, to manage each servo, which will fit exactly into a TruTrak footprint. Add power, ground and an interrupt wire, and that's all the servos need to perform. The outboard control modules are also optional, as all functions will be available from a standard D100/D10A/D180 with a software upgrade. Initially, the autopilot will have heading or track-hold mode plus altitude hold (assuming you have both servos, aileron and elevator). The altitude hold function will also, the current thinking goes, have a capture function. Change altitudes via the bug, and the autopilot will climb or descend at a predetermined (and pilot adjustable) rate until reaching altitude, where the autopilot will command a level off. 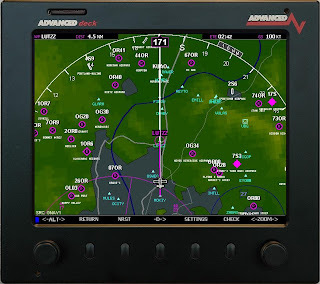 Navigation sources include GPS and VOR/LOC from a Garmin SL 30. If the installation has an HS-34 external ARINC module, the autopilot will follow those commands as well as (in a future version) vertical and lateral steering commands from a WAAS-approved GPS. Heavy rains over the last two days have left the Lakeland airport a mud-sodden mess. Early impressions are that the show traffic will ramp up slowly; areas of aircraft parking were notably bare, likely a result of the mud. Press conferences are scheduled throughout the day, and we’ll bring you news from the show as we get it.